I had a lot that I needed to do last week. Therefore, I began a pair of mittens for myself. I doubted there would be enough yarn to make them, and since this was my handspun Kool-Aid dyed yarn, there is no more of it in the entire world. I thought I was done with the first mitten and I tried it on, but it was a bit tight at the top. I ripped back and made it longer. Still, the thumb looked a bit big and wonky, but it fit well enough. This was the left mitten. I weighed it. I weighed the remaining yarn. 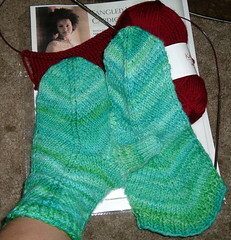 The yarn left weighed more than the already completed mitten, so I cast on for the right one. I made my way to the top of the mitten and began the thumb. It looked a little better, but the yarn was nearly all gone. I tried it on. The thumb was too short. I ripped back some of the left thumb and used its yarn to fix the right one. Still, they were not quite right, and I had used every bit of yarn. I tried washing them to see if this would change the situation. People told me they looked fine, but that right thumb was wrong. I knew that I would not wear them, and I really wanted to wear these mittens. I decided that the ill-fittin' mittens were my punishment for not having done what I ought to have. The Skanks decided that I must have lived a good life if a tight right thumb is how I am punished. Anyway, I ripped back to below the thumbs and am trying again. I hope it works out right this time. If not, I know what to do. After setting the mittens aside, I grabbed my Merino Style and some US 4 needles and began to swatch for my Tangled Yoke Cardigan. I knit on and on, and then got out the tape measure. No gauge for me! I had brought my entire Options set, but of course, I needed to go down in needle size and the set only goes down to a four. Oh well, I needed that pair of needles back to re-do the mittens. So now, I am swatching with US 3 needles, and I may not have gauge yet. I guess I am quite a loose knitter. Also, does it make sense that using the same needles, I would get 24 sts and 36 rows/rnds per four inches in both stockinette and garter rib? Let's just see if I can find a needle where I can match gauge in stockinette, eh? Also, I need to make sure that I choose to knit the correct size. I sometimes have a bit of trouble with that. I think I am between sizes. I want to knit something that I will wear. I cannot wear one that is too small, but I am not trying to knit a baggy sweater, either. I just do not know. Add to this a bit of unhealthy body image, and it is just as well that I am still swatching. Anyway, I did some math, and may be able to use the US 4 needles and knit a smaller size, but my gauge difference would make something between the two sizes I am considering. In that case, the sweater would need to wait until I finish the mittens. With all of this trouble starting my Tangled Yoke Cardigan, does it mean I am supposed to be doing holiday knitting? Then there is another adjustment to gauge to show you. I was going to knit myself a pair of mittens from Folk Knitting in Estonia. I grabbed some Palette and began. 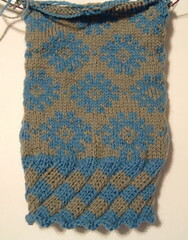 My loose knitting means that I am knitting this pair of mittens for my husband. It does not get as much work as I would like because I am afraid of breaking my Harmony needle and so it usually does not get any away from home knitting time. I am too tired to make any decisions tonight, and it is not even eight o'clock. Maybe next time I will show you a different frog encounter. The recent enjoyable holiday week made maintaining a thankful mindset the other 364 days of the year easier. Much has happened. My grandparents have been in town. Grandma quilts, knits, crochets, and mostly due to my influence, has begun spinning. There has been so much to show and discuss. Grandma has a drop spindle. I tried to teach her the thigh roll. She said that watching me demonstrate the technique helped, but she did not quite master it. She bought Spinning in the Old Way by Priscilla Gibson-Roberts. Perhaps Priscilla's writings will help fill in the gaps. Grandma tried out my wheel. I wish that I were a better teacher. We tried so many different things. If only I had a staff photographer, you could see me treadling while Grandma handled the wool. You could also see where she treadled, and I tried to hold my hands over hers to help with the drafting. That probably would have been a good picture. Instead, you get to see Grandma going solo at the wheel. We had such a great time that it did not really matter that we were the only attendees at Friday's NAKG meeting. We had a fabulous trip out to The Knitting Zone. We visited with Mary and saw the animals. Mary burned off her holiday calories chasing her runaway pig. Mary nearly gave us her pig. Again, I do not have photos, but this time I have only myself to blame. Wait, I can blame it on wool fumes, right? 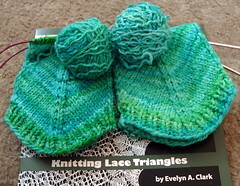 I picked up a little laceweight, some bargain bin yarn, a little sale yarn, and Knitting Lace Triangles by Evelyn A. Clark. I feel like I may be closer to triangular lace shawl design just from holding the book. Grandma (from Illinois) could not pass up some corn sock yarn and a little bit of fiber so that she can spin more. Satisfied with a trip to a wonderful yarn store filled with fabulous yarn and staffed by wonderful people, we got in the car without even trying to make any of the goats faint. I printed out some patterns from Knitty for Grandma and slid them into protective sheet covers. She was interested in my Fetching mitts. She plans to make some of her own. I may knit her a pair and send them up for a surprise. Her birthday is in a couple of weeks. Grandma and Grandpa will leave later on today. We hope they make it back down to visit again, soon. For now, it is time to rest up for upcoming holiday festivities. With the success of Thanksgiving under our belts, and this beginning for Christmas, I have hope. Next time, see me remain positive when things do not work out as planned. From nearly the first day I had my spinning wheel, I wondered whether I could do it. I thought it could be a recipe for disaster. If I had tried it then, it probably would have been. Still, the idea kept creeping back, and I had to try it. Plying can be a little easier than spinning the singles, so it seemed like an ideal opportunity to try. I tested it by just treadling, and when that succeeded, I set myself up to ply. It worked. It took a long time to do all the plying. Maybe next time I sit down to spin, I will be seated upon my stability ball. Someone stole a week from me. At least that's the story I am sticking with. I could have avoided this trouble by looking at a calendar or doing math. Instead, I just kept with the idea in my head that we had the Veteran's Day week, one empty week, and the Thanksgiving week. In my defense, there has been a lot happening lately. Since Halloween we have had two trips to the hospital (ambulance rides for each), a minor motor vehicle mash-up (ah, teenagers), a fungal infestation (please do not let it spread or pass to anyone else), four doctor's appointments (varying levels of competency), probable future surgery, the announcement of incoming out-of-town relatives (good news, but stressful, nonetheless), extended childcare duties, a radioactive new year, and more that I cannot think of right now. I am thankful to say that we are all doing fine and making our way through it. It looks much worse written down together like that. It is a good explanation for my delusion of one more week left before the next big wave arrives. Still, it has not all been bad. I have my birthday yarn. There's nothing like a huge box of new yarn arriving to make you cast on with yarn already in the stash. Especially if you anxiously awaited the delivery of the new yarn and complained about the time it took. However, I did use my new fixed circular Harmony needle to knit it. I like my new needle, although I worry about breaking it. I ordered the US 0. I need to be more careful with it than I am with my metal needles. Still, I think I might like to add more of the Harmony needles to my collection. 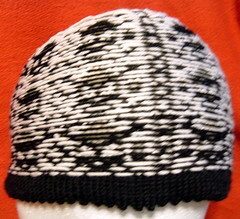 My new Harmony needle from Knit Picks was a great choice for knitting this hat for my nephew. 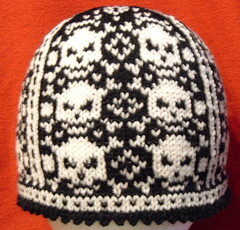 I knit it using Dale of Norway Baby Ull, and made a few minor mods. I am excited to give it to him. He saw it in progress and likes it. I have wanted to knit this hat for a while, but this was the right time for it. Now that it is off the needles, I have cast on for another stranded project. It is not picture-worthy right now, but I hope to have something to show soon. So much and nothing has been happening here. I am trying to figure out a better way of organizing my blog reading. I may need to read fewer, but I do not like that idea. I also do not like being so behind. I will find the right solution. I have many areas of life that need organizational assistance. I guess it is more of the process of life, eh? I got another package this week. I am hostess of the Caps for a Cure October/November round. I am excited to be able to show them all off before I deliver them. We have over twenty-five already. I have a Koolhaas currently stalled on the needles in need of time to find my error. Otherwise, I am nearly done with the hat. I read about this back in September, and meant to post about it before now. So far, my contribution consists of some hats and mittens, but I hope to knit more. It just takes a little time, a little yarn, and a little love. If you are so inclined to knit for the preemies, check out the link to Sarah's post. These things are so quick to knit. If that is not enough for you, there is a contest, too! Speaking of little ones, there is no need for the preemie stuff for the newest addition to the Skanky Knitters Family! We just received word that we increased in size by 8 pounds, 15 ounces in the form of a new baby boy! Welcome to the world, Nathaniel Ryan! I have much prep work to take care of today. The world-famous Kaitlyn is spending Monday with us. She is an adventurous girl, and I need to secure the environment in order to maximize safety and fun while minimizing the need to tell her, "No, don't touch," all the time. Spinning wheels and fabulous fiber are too tempting to not explore. While she learns to hear that not everything is available to her and that there are limits, I would like to do my best to not present too great of a challenge. I have a thought to take her to The Knitting Zone, my absolute favorite lys. For those of you who know Kaitlyn, fear not, I have a plan. We will see what happens. I guess I had better check first to see if they are open tomorrow. When I first purchased the lone, luscious skein of Cherry Tree Hill's Possum Lace, I thought that I would make something for my mom. It sat in the stash and waited patiently for the right pattern. Finally, the time and lace were right for the (sob) discontinued yarn to become. 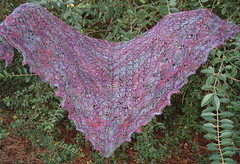 I settled on the Swallowtail Shawl from the Fall 2006 IK. I thought that this would be perfect for my tiny grandmother. I fell in love with the lace as I knit. I worried about the way the lace could be obscured by the variegations. I wondered if I could make the shawl bigger by adding repeats (no way, not enough yarn). When it came off the needles, I was pleasantly surprised at the size. It was about 52" across the top and around 30" from top to tip. After blocking, it measured approximately 60" X 32". That is a nice little shawl. Anyway, I tried it on and loved it, and was unsure whose this was to be. I consulted my husband with a list of three finalists: Grandma, Me, His Sister, Cassie, in Alaska. So, my precious possum, (the shawl, not the stray cat I feed), you are headed north. I hope you can warm Cassie and remind her that we are thinking of her far away, as she convalesces from gall bladder surgery. I feel like I achieved a nice result on this shawl. Yes, the different colors do hide the lace a bit, but I kind of like the effect on the nupps. I think the play between the colors and the lace is a nice match. I also think the size is nice and functional. It stays on and out of the way if you want to do something besides sit and be pretty. I will put the shawl out in the mail in the next day or so. I wanted to take nicer pictures, but every time I go outside the wind picks up. Therefore, I present you with a blocking photo, and one outside in the yard. p.s. My Knit Picks order arrived today, and another package I was not expecting that I will detail another day. It hardly seems like it has only been a week has gone by since I took my wonderful day trip to Tennessee. We have had a little adventure here at home, but everything has turned out well enough, and we will leave it at that. Anyway, I meant to tell you that Saturday was not all about the fiber festival. There was an excursion to Dunkin' Donuts (we do not have any locally), and my first ever trip to Joann (also none locally). There was a moonlight madness sale, and I scored Victorian Lace Today, a green Chibi, and some of Clover's Locking Stitch Markers. I also managed to help my fellow knitters. Knit Picks should send me a prize for the sales pitch I gave in Tennessee. I was able to introduce two new knitters to Knit Picks and Knitty (I have a Monkey on the needles). They needed a serious introduction to knitting in the round and circular needles as they discussed the frustration of fitting all of the stitches required for a hat on a straight needle. They professed a fear of knitting in the round. I gently encouraged, and wrote down a couple of websites to help them. Another knitter, this one quite experienced, walked in on the mini knitting clinic to get a better look at my circular needles. I said that I got them from Knit Picks. She said that she was already a customer and purchase yarn from them. Then she speculated that the cords on their circulars would be "cheesy." Still, a knitting problem plaguing her prompted her to reach out and touch the needles with a focus on the join. She confessed that her current circs snag slightly, causing extreme frustration and annoyance as she works to knit a sweater on US1 needles. She admired the nice, pointy tips, and I think she probably ordered up some needles when she got home. No, I do not really expect Knit Picks to send me a prize. I just want my yarn to get here ahead of the projected arrival date. I mean, come on, it is sitting four hours away, and they predict it will take five more days to get to me. Coming soon: the magic of blocking. It is small now, but blocking will increase its size. However, I cannot expect it to reach anything near these dimensions. Still, I already like this, and am reconsidering the gifting of it.